The term “daisy” is often used in reference to a wide variety of flowers of the Asteraceae family, which includes asters, sunflowers and hundreds of other flowers. They all have the “daisy-like” flower form, with a center flower disk surrounded by a rim of petals. Daisies are familiar cut flowers as well as garden flowers. The parts of a daisy plant are common to most flowering plants. The daisy plant roots are the underground portion that absorbs dissolved nutrients and water and begins transporting them through the rest of the plant’s vascular system. Roots anchor the plant in the ground, and provide support. Root division is one method of propagating new daisy plants. To make a root division, dig the root clump, and cut it with a sharp knife into smaller sections. Separate and replant the sections so each can grow into a new plant. Daisy plants have rigid, hollow stems. The stems are fibrous, and consist of bundles of tubules that are part of the vascular system. Each daisy stem bears leaves and a single flower at the tip. A stem may branch several times, and each branch will bear a flower. Daisy stems transport water and nutrients to the leaves and flowers. Daisy plants grow in a mound, beginning with rosettes of leaves at the base. The long, lance-shaped leaves are borne along the stems. Leaves at the base of the daisy plant are typically larger than those near the flowering tips of the stems. Daisy leaves perform transpiration and photosynthesis tasks. Transpiration is the process of water evaporation through the leaves. Photosynthesis is the process by which the leaves turn sunlight into energizing food for the plant. 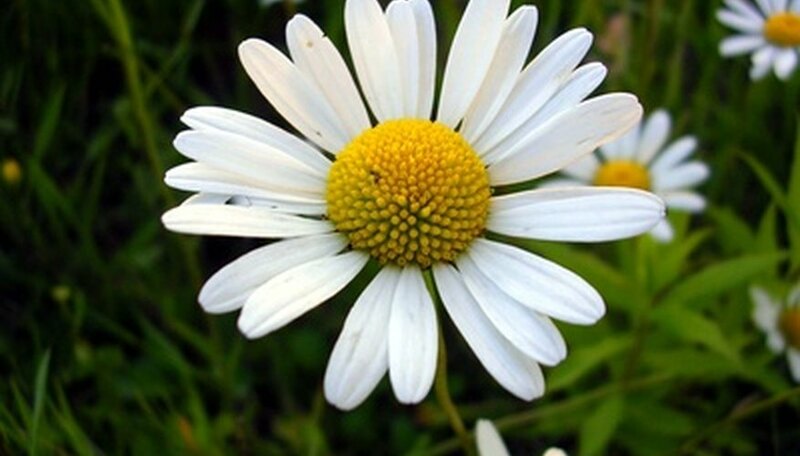 The daisy flower consists of the central yellow disk, surrounded by radiating white petals. Daisy flowers are long-lasting on the plant and as cut flowers. They attract a variety of insects and butterflies, and once pollinated, each flower produces dozens of seeds. Keep dead flowers trimmed off, and daisies will bloom from early summer until frost.